I'm quite aware this must have been asked many times, but I cannot seem to find the right search terms to get an answer. I would like to have Ctrl+Shift+Up move my workspace up, and similarly Ctrl+Shift+Down to move down. Currently when I use these shortcuts cinnamon shows all the available workspaces or goes into expo mode. How do I change this? Change the shortcuts for "Switch to left workspace" and "Switch to right workspace" to Ctrl+Shift+Up and Ctrl+Shift+Down respectively and you should get what you want. This answer comes late, and will maybe not 100% answer the initial request. However, the basic feature can be obtain by using a specific applet (using it now with 3.0, used it in previous versions of Cinnamon as well): Workspace grid (2D) and switcher. When active and added to a panel, this applet actually lets you define a “real” workspace grid (number of rows / number of columns), and provides an option to “Use Keyboard shortcuts (Ctrl+Alt+Up/Down)” to switch desktop rows”. With this option checked, it actually overrides shortcuts for “Toggle Expo” and “Toggle Scale” to switch between workspaces (and you will be able to move windows to workspace up/down with CTRL+ALT+SHIFT+Up/Down). Note however that it seems to be possible to still keep the option to have shortcuts for Expo/Scale, looking at the comments on the applets page. Ok, so simply replacing 'switch-to-workspace-up' and 'switch-to-workspace-down' by 'switch-to-workspace-11' and 'switch-to-workspace-12' in the "applet.js"-file , assigning shortcuts to them via "keyboard shortcuts" in "system settings" and checking the "Use Keyboard shortcuts (Ctrl+Alt+Up/Down) to switch desktop rows" option in the applet settings got everything to work. Now I can specify shortcuts for expo/scale and move up/down separately. Nice! Not the answer you're looking for? Browse other questions tagged keyboard-shortcuts cinnamon or ask your own question. How can I change my workspace switcher in Cinnamon? 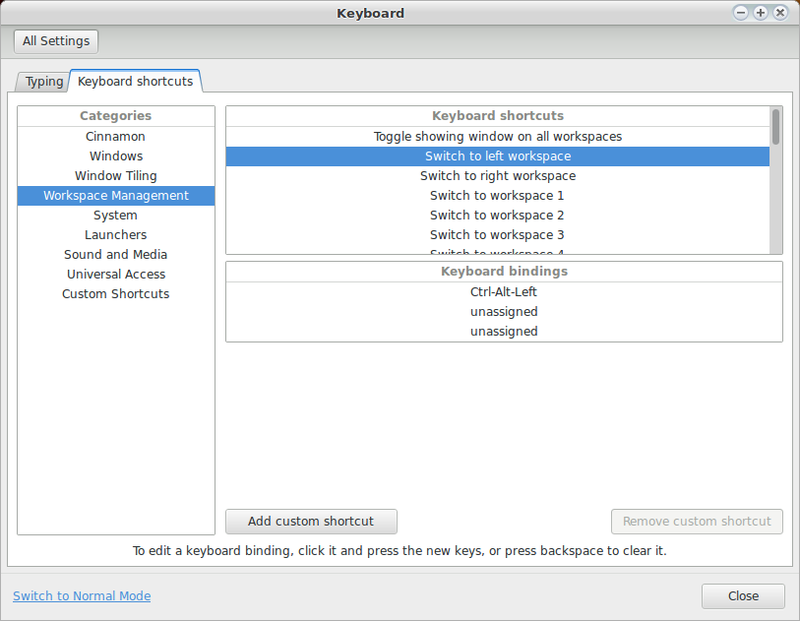 How to set up keyboard shortuts with custom modifiers (like Mod3) in Cinnamon? 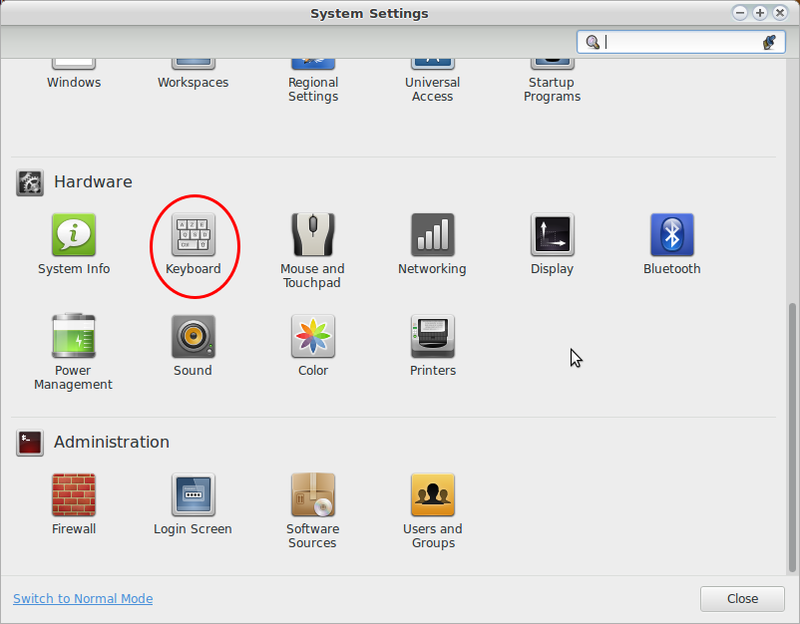 How to disable mouse-over workspace switcher in Cinnamon? Is there a key binding to switch to “last” workspace in mint 17.2? How do I edit the keymap of Cinnamon without using Cinnamon Settings?